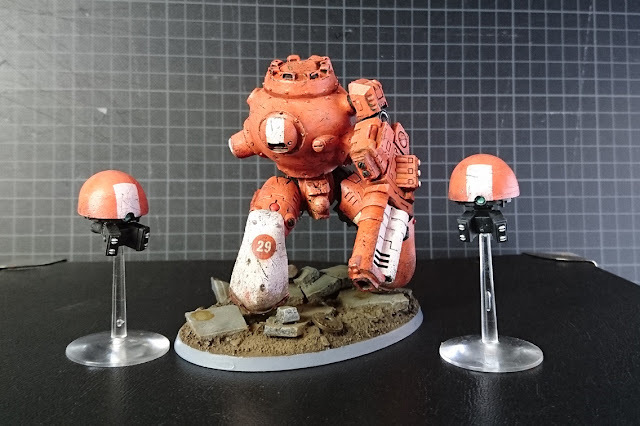 The Tau Ghostkeel that has been lying around in my shelf since it´s release is finally done. I didn´t plan on changing the body at first, but assembled and live the original one displeased me. Luckily i had a Taco Beetle kit form junk tank rock flying around wich i had no ideas for since then. So the body and lower legs are from that kit, weapon and groin/upper legs are GW. Why i chose him to orange i do not remember, since then i had only used that as a contrast color for my army, reserved for officers and such. Now he looks like a garbage truck from the Tau sept of U´trecht (boy am i funny today). Still i like him a lot and look forward to hiding him behind buildings the whole game because i just can´t see my nice robots die. Marco...please don´t shoot my robo.